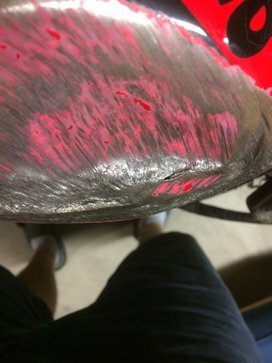 So I busted up my bike in turn 4 at Gateway. Looking for a little guidance on a couple things. 1. The tank has two small holes in it. I am wondering if JB weld will work or if there is a way to weld the tank without blowing it up. 2. The spool tab peeled away. It didn’t bust at the weld. It peeled away. I’ll try to attach pics. I would also like guidance on how to fix that if possible. At least sounds like your ok? Welding on a mc gas tank is no big deal for guys that know what their doing. With no where near the volume of say like a auto fuel tank its fairly easy to give it a good flush with the water hose then dry it out with compressed air and let air out in the sun or fan on it. The bigger problem from what I gather is the thickness of the metal. Alot of times its just too dificult to do a decent weld on it on areas like where youve hit. Sport bike tanks seem to have thinner metal than most the older tanks like harleys and such. Probably would have to take it to a known good tank welder and get a diagnosis. I know a guy in the foristell area but there are many around the st. Louis area. 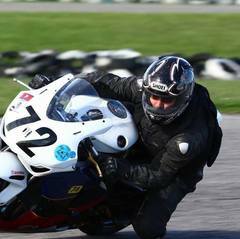 If its just a track bike you may be able to get away with using jb weld or similiar epoxy. I would just do a good prep before putting it on and sime kind of good tank sealer/coating on the inside. Or replace the whole thing with a used tank. 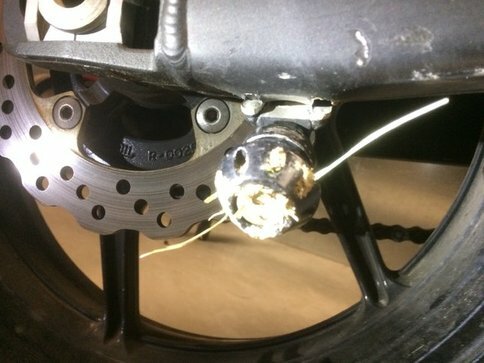 Is your rear swing arm hollow? Looking at the pic it appears to be. If so, and its tore open as it looks to me like...you may be better off from a safety standpoint to just replace it. 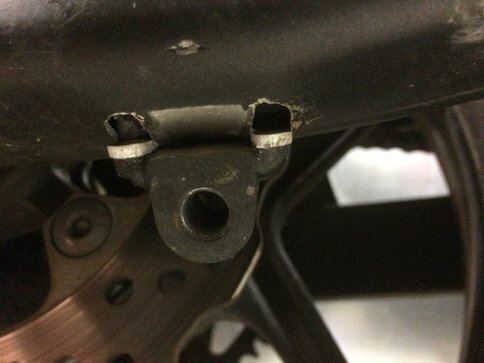 These alum hollow sport bike swingarms these days are extremely light and strong, but once you puncture/tear/bend/gouge that thin aluminum you weaken it. And just like a thin fuel tank, can be havok to do a decent weld on. If the spool is just tore and there is no swing arm puncture, then I would just have a new one welded on as long as the welder thinks he has enough thickness there to do a good weld with. One of the spools on my rc51 was broke off when I bought it. Supposebly they are easy to break on the rc51, rather than dork with it I just filed the alum down flush since it was a clean break and then cut and filed the other side too rather than risking completely ruining the swingarm by welding on it. I use a stand with the L shaped brackets to lift the rear, not as quick as a spool stand, but only a few seconds more. I’ll second just replacing the swingarm. 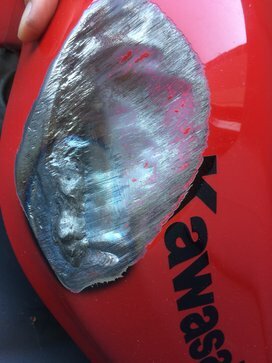 Aluminum doesn’t take kindly to repeated bending, and welding a piece that’s been heat treated (like I’m assuming a swingarm would be) will only weaken it further. tldr: Take that sucker off and make it into a lamp or something. I did have one welded on and if the swingarm is not bent, it's okay in my opinion but Evan is more sciency than me ? As far as the tank, here's a video. The guy used a MIG but I would suggest TIG then re-sealing the inside if you want to. So I’ve done a little research on the tank and a lot of people say to melt lead into the hole. This seems ideal because it wouldn’t break down like JB weld but I would have to find a way to get the gas out so I could get a flame on the tank to solder it. For the swing arm, I am tempted to try just welding because I wouldn’t expect a catostrophic failure even if it didn’t do well. I just have zero experience so I am trying to figure out what kind of risk that am looking at. Melting lead into it and welding it both create heat, though welding creates more heat. In both of the options, you would need the gas out. The tank is not difficult to remove from the bike (at least the bikes I have had) so you take it off, turn it upside down over a container and drain it. There are suggestions on how to rinse it with water and dry it..etc. The concern really is contamination of the metal with gas. Even though metal looks impermeable, it does absorb things from the fuel. Of course when you're brazing it, you are not really looking for bonding of the metals like you are with welding. Contamination will affect your welding process. However, since lead does not really 'bond' to the tank, it is just a filler for the hole. Welding on the other hand melts both sides of the break and fills in the hole with new metal. So, if I were to deal with this, I would either try the JB weld (filler option) or TIG welding and hopefully not have bad contamination. 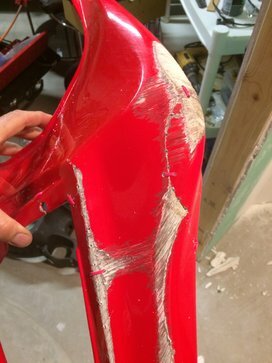 As far as the swingarm, if it is straight the only issue is if the weld for the tab fails, it can cause the bike to fall if it's on a rear stand. I would not expect that but it could be a concern. Again, I don't know a lot about welding, but these are things I have learned from others and reading. 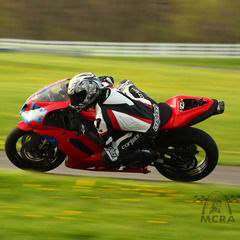 That looks like the hot ticket for the swing arm. It would cost that much to weld. I’m gonna call tomorrow to see if I can just pick it up and if they have a tank for reasonable I might bite on that too. Saves the guesswork in if it will be safe. I'm with Dave on this one, do some on line research and buy new or used parts. Everything from SBTT to Andre Taylor from Kansas City might have what U need in stock. There are plenty of Welding shops around town, however, this is a Warp Factor 15 bike used on the street/track. Not a dirt bike ridden on grass or dirt. Call a radiator repair shop if you decide to weld the tank. They're used to working with aluminium, and their welds have to hold up to a great deal of pressure, and temperature changes. Plus they may be able to test for leaks when they're finished. Lighting off a tank is pretty ballsy. I kinda want to try it now. X2 on the just picking up good used parts instead of bothering with welding. I appreciate the offer. I have a fair bit of mechanical ability but I’m still trying to look into swapping the swing arm bearings. The bearings on my bike have 7000 miles and the new swing arm has over 26,000. I have a service manual but haven’t looked into how it’s done. Did you get the parts you needed? I’ve had the parts for a while but didn’t have time to put it together. I had a buddy weld the hole in the tank. Foot brake lever was only very slightly bent and was fixed in the vice. New peg and toe piece. Bought a used swing arm and just installed it today. 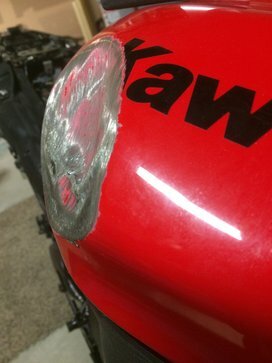 I forgot that the chain goes through the swing arm so I had to cut it. Not sure if I can get a link or should just replace it. Spent some time sewing the plastic back together with zip ties. I’ll use some epoxy for good measure before I install them. I’ll take some pics in a bit just because of the level of ghetto. A cheap chain rivet tool will push a pin out, then squeeze a new link in. 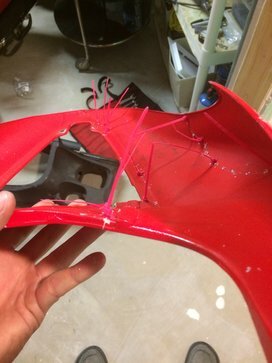 Pics of the gas tank weld? I'll have to dig it out. Didn't get it put on the bike on my days off. It is a little ugly because it was thin where it ground away, but it ended up being real solid after building up the area he blew through. Ya my first car a 1967 Mustang cost me 600.